A short design exercise to propose an interiors concept for the lobby of the headquarters of world’s leading robotics company, DJI, in Shenzhen, China. 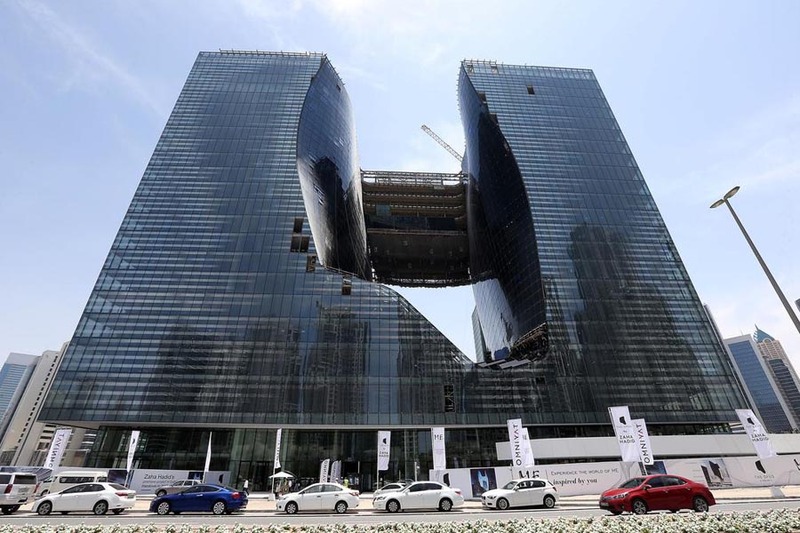 Located in the beautiful towers by Foster and Partners, the architecture of the building had a lot to offer and we aimed to reflect the geometry of the towers within the interior design of the space. Building on the architectural concept of intertwined boxes and referencing to the general colour palette of the rest of the building, our proposal aimed to deliver a space that is generally calm and well-organized, but also integrates touches of the visionary culture of the DJI company. Internal zonings consisted of a Leisure Lounge, formal and informal meeting zones, Food Lounge and a Gaming Zone. 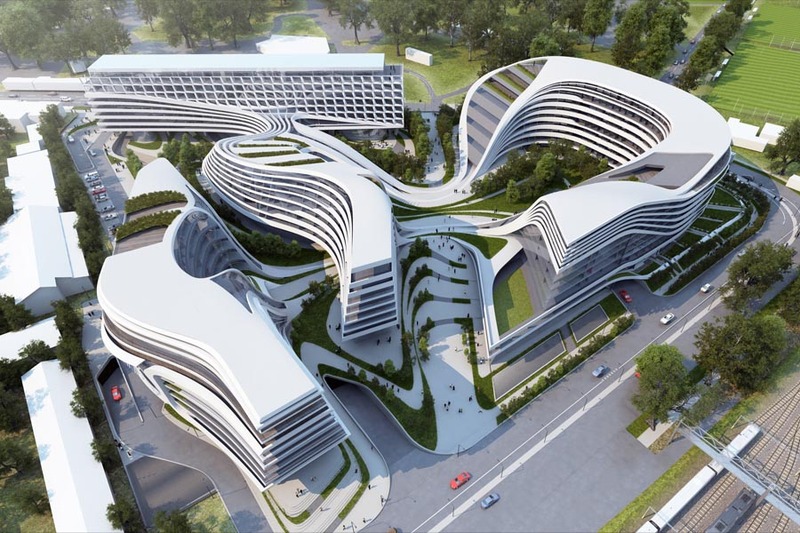 The Complex was designed as a multi-layered porous mass that opens up and integrates to its surrounding neighbourhood. The memorable image of this building, the convenience of use by the district’s residents and its internal comfort levels were our main sources of inspiration. To achieve an optimum massing diagram, correlating to various programs of the buildings and the great vision of organizers, we analysed key parameters of the site, the climatic conditions and the importance of recreation of the local market. 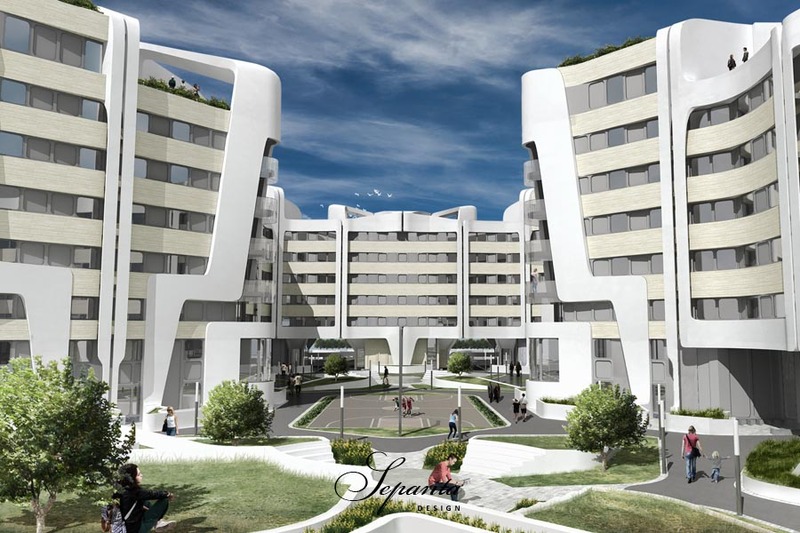 We envisaged this Complex as a mini-city in its own rights. 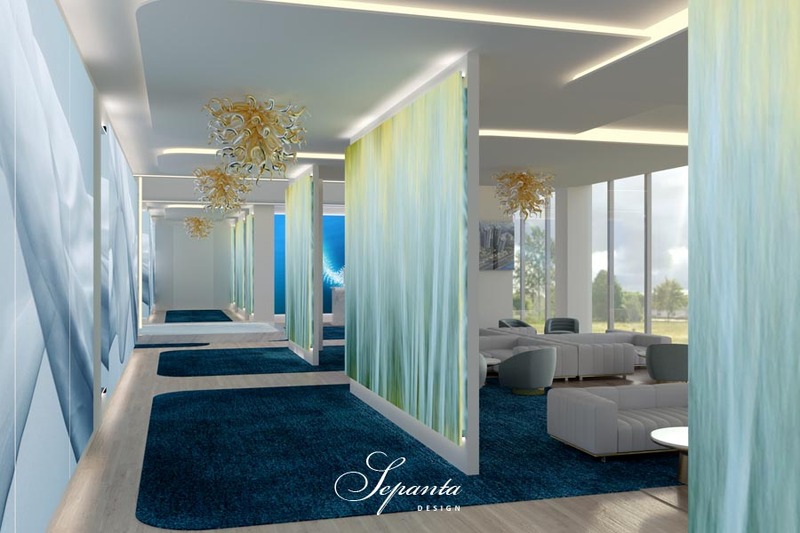 It was important to us that the overall feel and experience of the project is a continuous one that creates a vibrant and active atmosphere for the residents and staff. 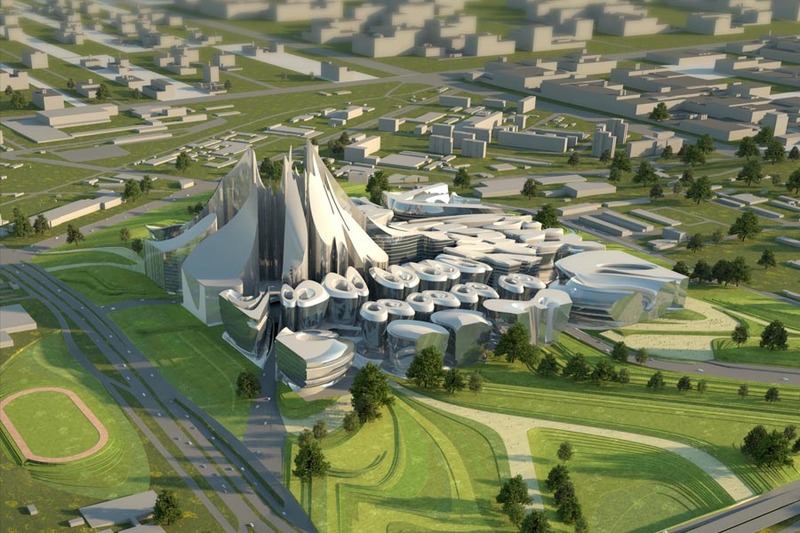 This design was meant to push the conventional concept of the government building by creating three type of zones – for the community, with the community, by the community. The juxtaposition of various volumes of the project, overlapping the programs horizontally and vertically were all to create variety and flexibility of use. The massing of the complex was designed to achieve a skyline that is humane and has a human scale. 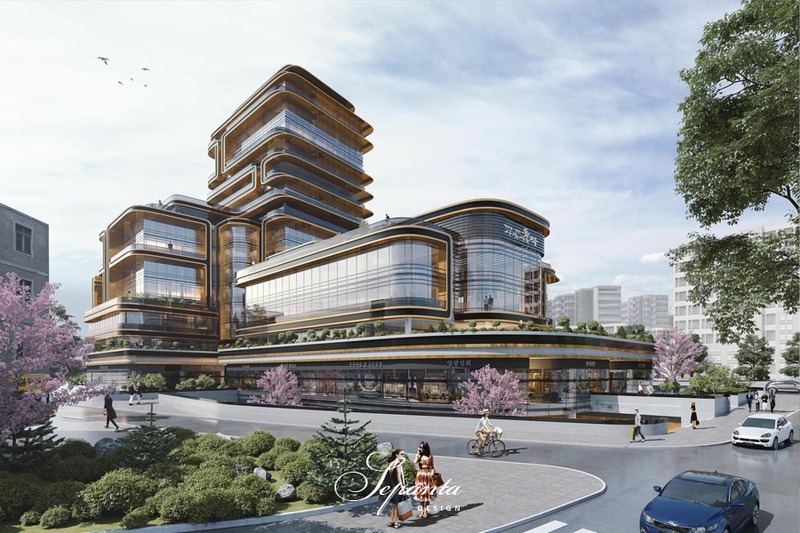 This project was a brief design exercise, proposing an interior design concept for Zhongfu Sales Center in Zhuhai, China. The brief was to prepare a thematic interior design concept based on local characteristics of the area and the project itself. Given the importance of element of water for the client and the location of the site by the river, Water and Nature were chosen as the general theme of the design. The proposal included an optimasation and rearrangement of the existing floor layouts, as well as proposing an interiors concept. relocation of the lift connecting the two e levels of the space, adding a shallow reflective pool in the lobby, rearranging supporting office spaces and using Glass Art that can reflect the theme of the design as partition walls for the internal divisions of the space were the key design proposals for this short project. Flexibility and efficiency are named to be the main characteristics of a viable housing scheme. However, a successful scheme is the one that also creates a pleasant living environment for its residents and creates a certain character and ambience to which its users relate. In this proposal, we aimed to create a development which is self-sufficient in its own, and at the same time integrates with its surrounding neighbourhood. It creates privacy and enclosure that encourage sense of ownership and safety, but it also is open and porous enough to allow for a smooth movement within and around it. Orientation and specific arrangement of the buildings on the site and the apartments in the buildings would be case-sensitive and depend on the shape and orientation of the site, required densities, site access, etc. However, the very organized and systematic approach proposed in this project would allow for an easy adaptation of it to each site’s specific requirements. Apartment views, green and pleasant gathering and communal areas and achieving a very optimized and functional layout for all the apartments in the project have been other key parameters in design of this proposal. Interior design for the station main arrival hall, train platforms and annexed shopping and art zones was a thematized design, based on the concept of “Shenzhen, City of Piano” and “Happy Shenzhen, beautiful Blossom”. The proposed design looks at Shenzhen as a progressive city within China which is the cradle of Technology and Art in South of the country. Optimizing the circulation routes within the main hall and proposing an organization of the space which is based on the optimum circulation routes is the first step in creating a station environment that can take and guide a high traffic of its users in peak times. All the elements within the ceiling and on the floors follow this organization system. The interior design also tries to build its story upon the existing architectural elements of the building itself. The platforms design is a simple and elegant one with the purpose of allowing a smooth movement of the passengers on and off the trains, while also providing comfortable seating and waiting areas. All the elements of the design on the train platforms come together as one organization system that utilises MEP services, lighting, signage, seating and art together. The shopping and art zones of the building however are a different story. Here the spaces were reshaped to create a maximum engagement of the visitors with the stores and exhibited arts. A unified screen for all the retail elements, as well as dedicated permanent and temporary facilities for art exhibitions are the keys criteria of these spaces. 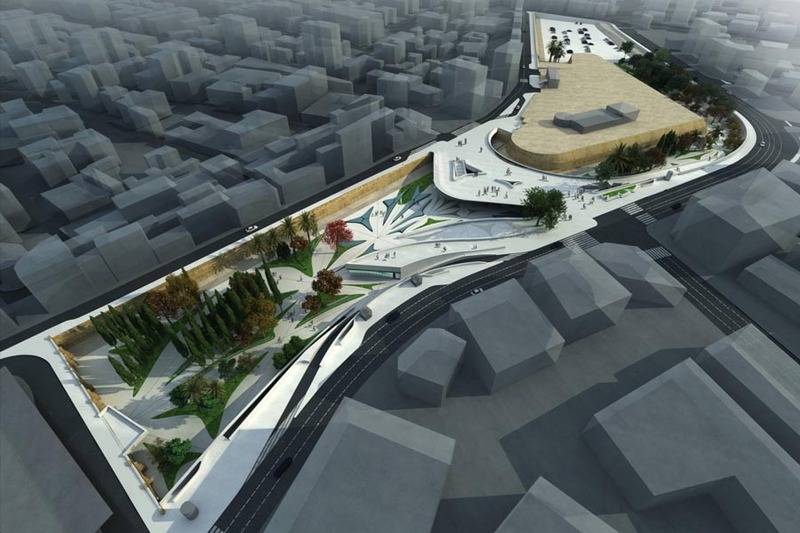 The design emphasizes on celebration of both physical and tech-oriented digital art within the city. This proposal for interior design of an office space in Xi’an, China, aimed to create a warm, fluid and transparent office space for the office staff and its guests and visitors. The internal arrangement of the space was reorganized to create a clear subdivision of functions within the office hierarchical organization. 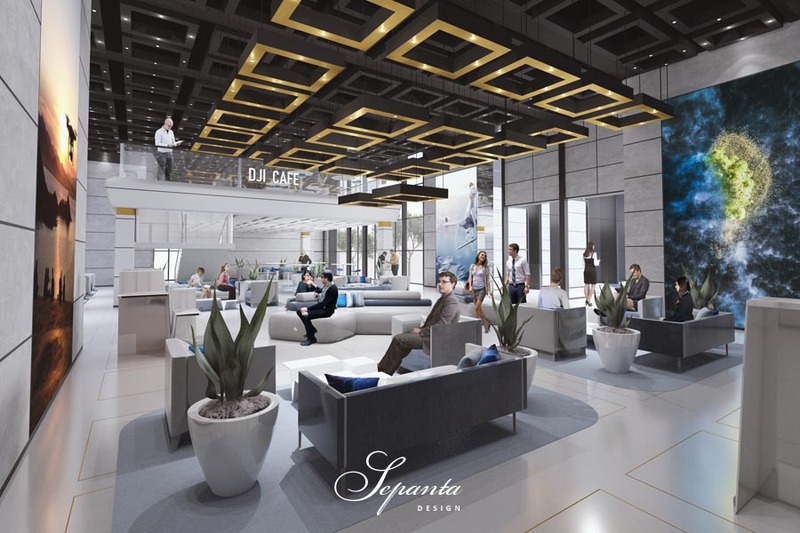 Clustering the management, staff and services would improve the performance of the office by the necessary separations, while a fluid circulation space would create a smooth and seamless connection among them. 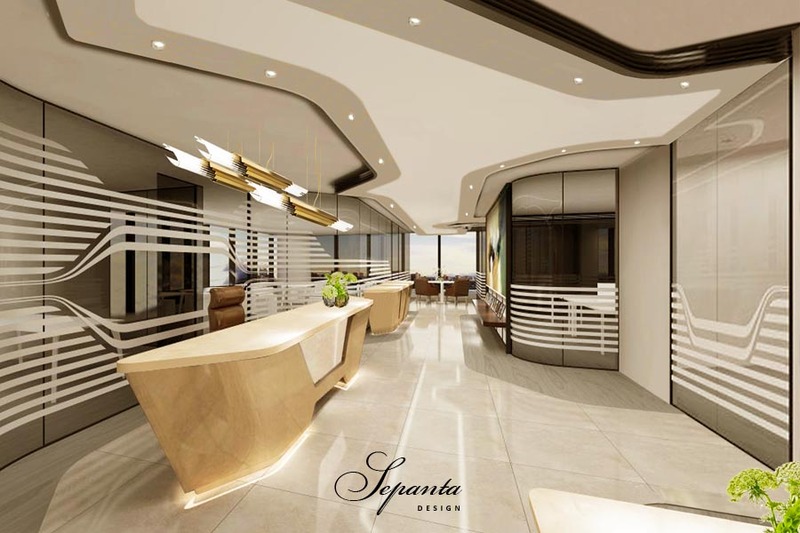 Using warm lights, natural stone and wood flooring and modularized glass partition units create a contemporary but yet warm working ambience. 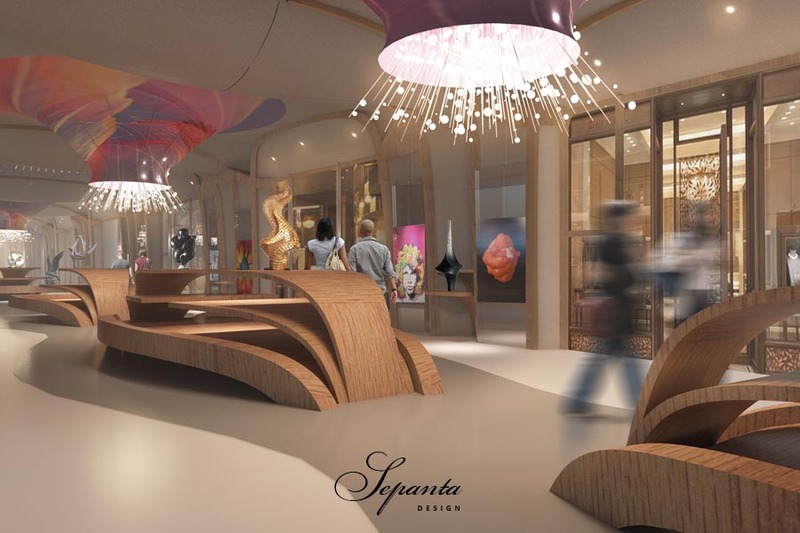 The proposal also included use of art and exhibition spaces within the circulation area.